When it comes to social media, one of the hot topics that is always coming up is whether or not buying friends/likes/followers is a good idea. In other words, is there a shortcut to social media success? If you really want something, the hard work and effort is always worth it in the long run and while buying large numbers of friends on social media may well give you the appearance of success – in the long run it could be highly damaging to your reputation. Is Buying Social Signals Worth it? A large part of social media is engagement. The more your fans interact with your social media content, the better your accounts will perform. If you have purchased 5,000 Facebook likes, it is very likely that they are fake or inactive accounts. It might look like you are popular when glancing at the likes total, but in terms of engagement your account is going to fall flat. If you have 5,000 fake fans and 500 real ones even if all of the real ones engage with your posts (which is unlikely) that is only 9% of your fan base. Those 5000 additional like mean nothing because they are just sitting their uninterested in your content! 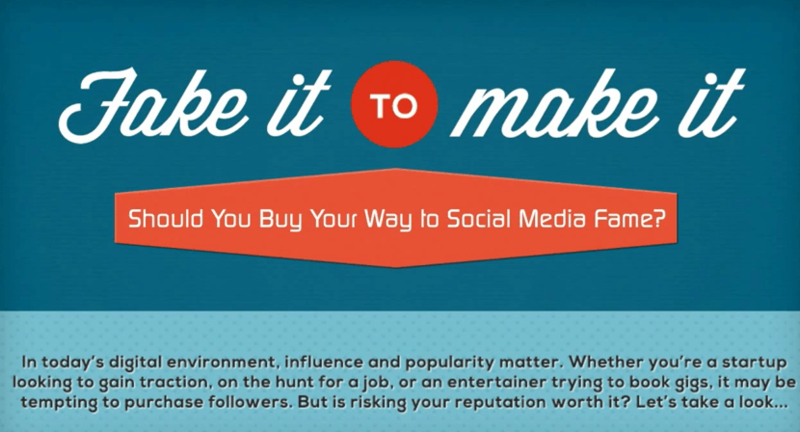 The following video titled ‘Should You Buy Your Way to Social Media Fame?’ (source) gives an interesting look at buying social media followers and how it can impact your social media strategy. Check it out and decide for yourself if it is really worth spending money on. Comedians, politicians, actors, musicians : a large amount of people within these categories are buying fans on Facebook or followers on Twitter. But also startups, new bloggers or job seekers are purchasing social signals. According to the Fake Follower Check Tool, from StatusPeople (note that they state the results can be inexact), top personalities like Lady Gaga, President Obama, Shakira or Oprah have something between 70% to 80% of fake followers on Twitter. In 2012, Mitt Romney was accused of having fake followers, having gained 80% of his +800,000 (now 1,500,000) in just 3 months. His following saw a 17% spike in one day : July 21th, 2012. I have checked my profile via the “Fake Follower Check Tool”, and the results are above..
Now, I have +22k followers on my Twitter profile. Not bad, if these numbers were real! Both YouTube and Twitter have outsized fake followings of 30% and 37% respectively. Some businesses have been accused of paying for reviews on sites like Yelp and Google+, sometimes finding reviewers on Craigslist. What’s the Price of a Large Following? The average price is 0,01$ per Follower ($10 for 1k Followers). There are so many sites where you can purchase views on YouTube, followers for your Twitter account or fans for your Facebook page. I’ve even seen pre-built sites listed on Flippa, ready to sell social signals (of course money wasted). The true is that also the “established” sites selling this kind of services use bots or inactive social media accounts. You can find the same offers also on popular places like Fiverr, or Freelancer. You should read : How to Get Likes on Facebook – 500 and More FB Likes in 2 days! Fake followers won’t add any substantive engagement to your social networking. According to Klout, they’re likely to detract from metrics like your Klout score, used to measure your online influence. You can also use tools like the previously mentioned “Fake Follower Check Tool” to weed out the imposters on Twitter. On others online tools, like TwitterCounter.com, there is an option to enter a name and receive a 3 months view of the follower count. If there are irregular significant jumps, then all signs point to fake. On Yelp, if a company has too many suspicious reviews, they are going to mark it with a note stating the company was found trying to manipulate their system with fake reviews. Do you know that fakers risk getting caught and banned from social sites? Facebook’s headquarters reported approximately 83 million fake accounts that they are cleaning up. In this regard, I remember to have accepted a link placement on my very first blog (now inactive and near to closing it) in exchange of 1000 Facebook fans to the page of that site. The count of the fans actually arrived at that number, but then after a few months has been drastically reduced since the cleaning of Facebook fake accounts. There are a number of signals which are going to help you spot a fake account. – they don’t seem to talk to anyone, and no one seems to talk to them. Obviously the “egg” as a profile picture is the first characteristic of a fake profile. Also, you can note that content posting is inconsistent and it’s low quality, with the same message over and over again. Based on experience, buying or getting fake social signals are definitely not worth it. There is actually an alternative, and it’s the “social exchange” (see AddMeFast.com, for instance). Surely, the best way to go is being natural, as it is the only one that pays in the long run. If you are online with the intention to build a business, or a strong reputation, then do not worry about getting fake followers fast, sooner or later you are going to build your own solid audience of fans. buying friends in real life is a bad idea. so it is definitely a bad idea in social media. I find harder to buy friends in real life, than purchasing fan in social media. But still I agree with you! Fake accounts never last long, nor do the fakers as they’d leave you as soon as they joined you too, for whatever reasons. I must check out that faker account link you gave…would be fun! I actually didn’t know that you could even buy x number of followers on Facebook or Twitter, till a few months back!! No wonder some profiles have such huge number of followers, while they hardly have any number of tweets, nor are their profiles that well done up. Yes, it’s any day better to have a handful of followers, the ones you know who would appreciate and share your posts, and that’s what I prefer, keeping it all natural and clean. Speaking of which, I’ve somehow never had the time to follow people, they have always followed me and I follow them back, after checking their profiles. So, this ways I always know they’d stay in most cases, a few are always an exception, and I am glad they are all the engaging kinds, thanks to Triberr too for the great connections, isn’t it? Not to mention your wonderful community as well. You’re fantastic in building relationships and your followers know that! Being real, honest, helpful…it is the natural way to create an awesome numbers of fans. It’s my pleasure for being part of Aha-Now community. And thanks for being active at Klinkk too! Friendship in real life is not by force, you don’t buy friends with money, therefore, it is real fake to do it online even in social media, in Facebook for instance there are a lot of friends that we never chatted with since we became friends. I agree with you, Emebu. I think the behaviour of each of us is the same offline or online. For once, I really against those buying Twitter followers. Just felt it is just a waste of time. Haha! Oh yes, great theme you got there! Love it man. So you are going to try to buy some fans on social media? Well, let me know how it goes, then! I am glad you noticed I changed layout. It was time to update to HTML5 and to a responsive theme. What’s better than Genesis Framework? This title caught my eye and I’m sure glad I came over to read this post! “Fake it till you make it” never works! You can spot it so easily when you are a blogger, go to someone’s new post and see that it has be shared 365 times on Google+ and 500 or so times on Twitter. Hmmm The first thing that comes to my mind is that they have purchase something that has pumped up their numbers. So what’s in a number? Nothing at all! Are they real followers? Of course not! Can they be hitting a danger zone with hackers? I suppose! For me, its a slow and steady process. If someone likes me they will follow me and I will get to know them, and they will get to know me. That’s the whole point isn’t it? Less is more when it comes to followers. I rather have 500 loyal people I know on my Facebook page that will comment, will visit my blog, or just stay back in the sidelines until something “strikes” them and they engage. How can I ever know 3K people and have a real engagement process going on? It’s all about being social, so having fake followers does not impress me at all. Rather, when I spot it, I do feel that there is some kind of desperation in that person, or maybe they were just taught the wrong way. I love this article because you are bring out such an important factor to people. I was told to do this when I started, but didn’t buy it. I just hope that many will read this and get the truth. What’s the point of having 100,000 followers on Twitter if not even 0,1% of them will engage with you? It’s much better 1000 followers with a 10% of real and true interaction!!! Pumping up the social media numbers does not take you anywhere. It’s much better the natural way. Thank you so much for being here, reading and commenting, Donna. I couldn’t agree more with this conclusion “…buying or getting fake social signals are definitely not worth it.” My heart cringe at the thought any brand buying followers. This is fake and should be discouraged by all means. Fake it to make it is a strategy that deals a huge blow to the credibility of a brand. Its still good having this article expose the statistics that would make us rethink our strategies! Natural building of followership should not be sacrificed on the altar of paying for or buying likes, follows, friends! This comment was left in kingged.com where this post was shared. and upvoted. I’m glad you confirm the points in my article, Sunday. This post will act like an eye opener for those who invest time and money in buying fake followers and fake likes. I think, buying social media fame is not worthy. I prefer to do it manually because I could feel the own satisfaction. Well, maybe I do not believe the “shortcut” though. As Sunday said, we should naturally get followers in order to get a solid business footing. This comment was left in kingged.com where this post was shared and upvoted. There is no shortcut if you want to build a solid business and audience. Thanks for adding your views! I’ve never purchased followers or friends for any of my social accounts. In the beginning though I did do the add followers automatically because I was taught it was all about the numbers. I admit being pretty ignorant back then and I did it but eventually I think I’ve now deleted all of my followers twice on Twitter and once on Facebook. I eventually started learning more about this and realized that I didn’t know those people, they didn’t know me nor did they care to. That’s why it’s taken me this long to build my Twitter account back up to just 8,000 followers. I still don’t know all those people but I use the program ManagerFlitter to clean mine up periodically. I only have one follower with an egghead but that’s my nephew. He still hasn’t set his profile up but I forgive him. I delete the inactive and I don’t have any fake accounts following me. I do this probably every three months I guess just to try my best to keep it clean. I’m sure that every program is different though so I’ll have to test this one out to see how I rate. Thanks for this scoop, good to know and I agree… Don’t do fake! I believe being sincere and honest is the best thing. In addition, the ethics makes you sleep well at nights. I also think that the behavior of each of us in our lives, is reflected on our activities online. You are a great person, Adrienne and I’m happy to have you in my friendships. What an eye-opener that video was about all the fake followers of those celebrities. Good to think we know better than they do – for all their highly paid marketing advice LOL. I’ve never bought followers or likes, and pleased not to have wasted my money. it’s a waste of money (and time). Better go the natural way. Definitely more efforts, but it pays off in future. Thanks for being here commenting, Joy. Have a fantastic rest of this week! You have pointed out good thing about Social Media Network. According to me, Buying of counter feed likes of any Social Media Sites is a matter of total ‘floccinaucinihilipilification’. Al though, We are all depend on Several Social Media to promote our posts around the internet but if we follow wrong strategy to do it, then disaster will follow. Thank you for sharing this post on Kingged. Ah ah ah, love that word : “floccinaucinihilipilification”! I really gives the idea of how worthless is buying social media fans. Oh my God shocking information. It means so many celebrities has tons of fake followers. They are getting followers with wrong ways, I mean they are purchasing followers. Its too bad. Shocking, but true, Dr. Diana! Even though it can take a while, getting individual users to voluntarily follow you means a lot. It’s kind of like getting laughs as a comedian. People don’t laugh unless the comic is funny. And people don’t follow you on Twitter unless they think you’ve got something interesting to offer them.